This is the number one most frustrating and pervasive falsehood out there. I hear it from the Fox News people – those conservatives who love to make original quips like, “They should get a job, but first they should take a bath, har har.” Sad thing is, I hear it from moderate OWS supporters, too. So here. Please. Take this post and spread it around. Print it out, and bring it along. Tattoo it to the inside of your eyelids. (Sorry for that imagery). We know what we want. We do, we do, we do. I’m taking these first four line items (with a few updates and edits) from my recent post, How to Defend the Occupy Movement Over the Holidays. If you’d like to see any of these topics covered in more depth here on my blog, vote in this poll before 11/28/11. 1. Occupy wants money out of politics. We want corporate personhood revisited by the Supreme Court. Corporate personhood is a big issue, and one that extends beyond money in politics. For the sake of the OWS argument, we can discuss it in the context of the 2010 Supreme Court ruling (“Citizens United“) that states that corporations may donate freely to political campaigns. This, essentially, means corporations can buy whichever candidate they believe will most favor their own interests. It means that few if any politicians are truly by the people or for the people, because average citizens don’t have the financial power to catapult any one candidate into office. In One Sentence: Occupy Wall Street wants Citizens United / Corporate Personhood revisited and changed. 2. We want more regulations on big banks. After the great depression, regulations were placed on banks that prevented them from engaging in certain risky behaviors that could jeopardize the economy…again. The most famous regulation was called the Glass-Steagal Act (GSA), named for the two congressmen who were its legislative sponsors. The GSA, in short, prevented three big industries from co-mingling: insurance, banking and investing. The financial sector wasn’t a fan of this act, because it kept them from making exponentially more money. Things were going well till the late 90′s, when after decades of lobbying, a new bill was passed (Graham, Leach, Bliley) that basically kicked GSA out of the game. The 3 industries merged, and it wasn’t long before the whole system collapsed under the weight of its own greed. In One Sentence: Occupy wants GSA reinstated, and many conservatives agree. 3. Occupy Wall Street is concerned with the growing income disparity between the ultra-wealthy and the lower classes. The movement believes the middle class is rapidly disappearing. 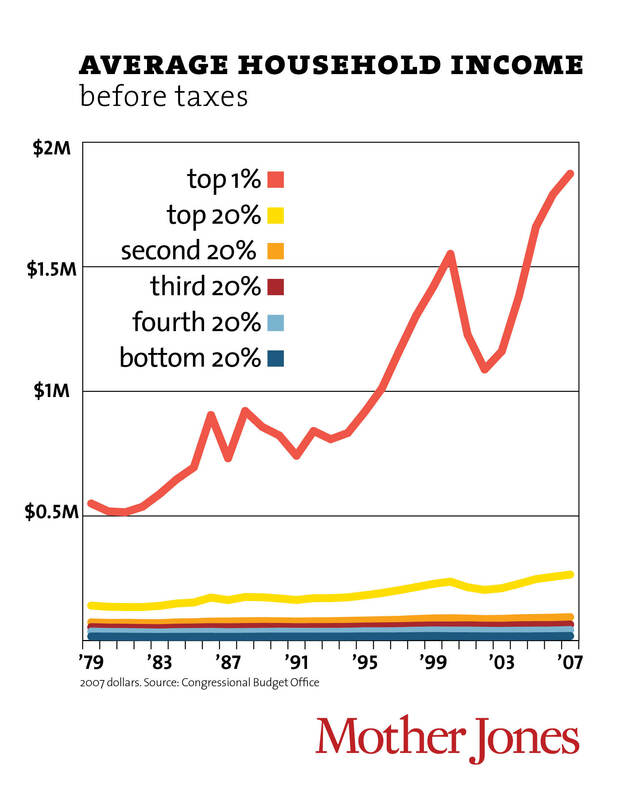 Average people are becoming poorer, while the richest are becoming richer, and before OWS, no one seemed to care. We believe our children and grandchildren will have to work harder than we’ve worked, to have less privilege and fewer comforts. The movement has gotten the country and the world talking about this problem. So that’s already a major success. Besides talking about it, what can we do about this enormous all-encompassing issue? Occupy Wall Street thinks a great place to begin is to stop cutting taxes on the rich. One pretty obvious reason congress may not want to cut taxes on the richest Americans is that they themselves are in that group. I mean c’mon who would elect to pay more taxes, given the choice? (Um, lots of rich Americans, but I digress.) Another reason: the people who donate to their campaigns – see #1 – tend to be quite well off. Conservatives argue that raising taxes on the wealthy would not make that much of a dent in the economy. Occupiers and most liberals tend to disagree. Conservatives argue that raising taxes on the rich will discourage the “job makers” from creating more jobs. Right now, the wealthiest have the most lenient tax scenario ever and there still aren’t jobs, so that theory is dead in the water. Some say that the “problems” our country is facing are no worse than they ever were. Again, occupiers tend to take a look at graphs like the one above, and worry about what that chart might look like if the lines continue on the same trajectory. We fear it could be a lot like this diagram. In One Sentence: Occupy would like taxes raised on the wealthiest Americans, and lowered for the middle class and the poor. 4. Occupy wants professional lobbyists out of Washington. Big corporations spend fortunes lobbying congress. Lobbyists write their own bills favoring their own special interests, and congress often passes them. This means that businesses have disproportionate impact on governing law. Bills should be passed and laws should be made to favor the majority. Occupy Wall Street believes the majority (the so called 99%) should have equal influence on legislation. In One Sentence: Occupy would like the impact of professional lobbying to be limited, beginning with a law that prevents lobbyists from writing their own bills. These four ought to be concise and specific enough to make even the most closed-minded, msm-strung-out occupy-hater have a normal conversation about issues that effect everyone. You can choose on your own whether to take the conversation further into things like civil liberties, America’s disenfranchised minorities, our problem with consumerism, wall street’s greed, the fact that far too few white collar criminals have been tried and jailed for the unlawful and unethical risks they took with the global economy. You can even take it to environmentalism, because that’s a big issue for Occupiers. These issues, while close to our hearts, might be too much for your average occupy critic. So if you find the waters of your conversation are becoming muddied, bring the dialog back on track and see what happens when you stick to the four points of reform mentioned above. For more, there are some very poignant and concise tweets at #ioccupybecause on Twitter. I’ll just toss an idea into the ring; I understand part of the issue with lobbyists is that bills are frequently way too long for Congresspeople to read before voting on them. I expect they have staffers read them, but the situation likely makes them more vulnerable to being told how to vote. If there was a law that a bill couldn’t be over twenty pages long, plus a one-page executive summary (complex legislation would thus need multiple bills) it might help. Great post, by the way. Well said; and any candidate I can vote for that wants this – has my vote. Excellent article! It really goes in-depth as to what the 99% wants, while at the same time being crisp and to-the-point. The “sum-it-up” sentences at the end of each “want” also reiterate the overall message, and makes these points easier to discuss with others. I give it a thumbs up! Thank you so very much for writing it! I hope it brings a wealth of new understanding concerning the occupy movement! Thanks for reading, and for commenting! Hope you’re able to use the talking points in RL conversations. This shows how much the media has us brainwashed. The occupy protesters do know what they want, and to cover it up the media is portraying them as uncoordinated bums. It’s great to see an article that is shouting the truth for once! Thank you! I like the picture of John Boehner. 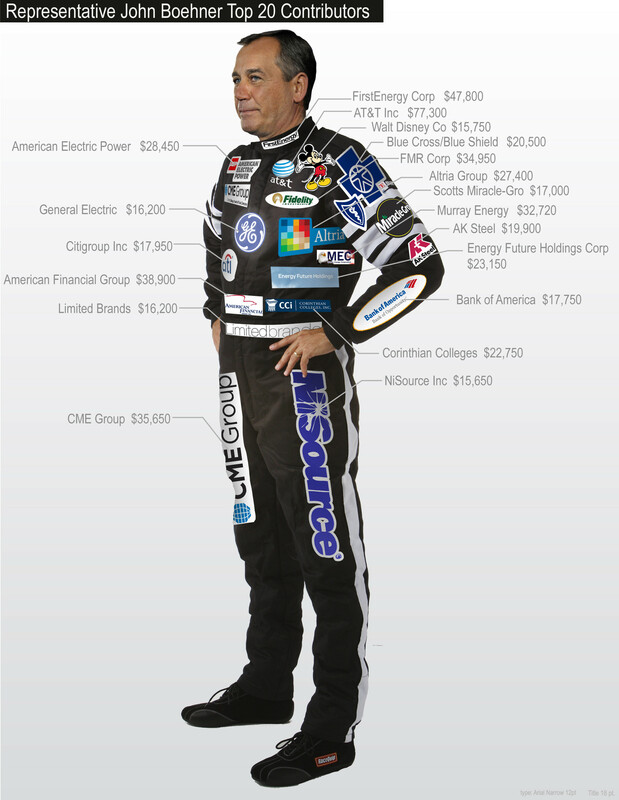 I always said that if they had to wear logos of their corporate sponsors, politicians would resemble Nascar drivers. sign up and you'll receive an email when I update this blog. Žižek at OWS: "Don't fall in love with yourselves."